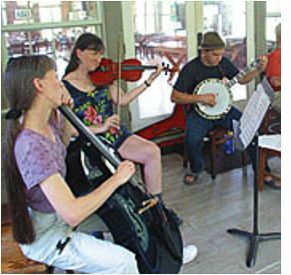 A music class is scheduled at the Folk School just about every week of the year. Renowned musicians lead the class in daily instruction. During the week that students are at the Folk School, they are living in housing, eating meals with other students who are attending classes in other subject areas, and are exposed to many other traditional and art and craft forms. Dance Musicians' Week, July 8-14, 2012A fun-filled week devoted to learning and improving techniques of playing and arranging music for traditional contra, square, and couple dancing. Students participate in slow-tune jams, ensemble playing, presentations, tutorials, discussions, and dancing. Students and instructors play for nightly community dances in historic Keith House. The school's relaxed, non-competitive environment makes for a wonderfully unique experience. Dulcimer Celebration Week, July 22-28, 2012Taught by nationally known instructors Anne Lough, Neal Walters, Heidi Cerrigione & John Cerrigione. Join in an inspiring, creative, and fun week for both mountain and hammered dulcimer players of beyond-beginning through advanced levels. Expand your repertoire, technique, and back-up skills in small skill-level sessions, small ensemble and large group sessions, and informal jams—all in a relaxed and encouraging atmosphere. Bring your dulcimers and any other instruments you play!